The handsome Hungerford Town Bridge gives easy access to the centre of the town which is set out along a wide main street. Wootton Rivers - The village is very pretty & composed almost entirely of timber framed thatched houses. The pretty village of Wilcot has with several thatched houses scattered around the green. You soon pass Newbury racecourse on your left. See their website for details of race days. Concerts are also hosted here. The River cuts right through the town and above Newbury Lock is the delightful quiet West Mills area where rows of terraced houses face the navigation and there are extensive moorings. Beware of the current below Newbury lock. 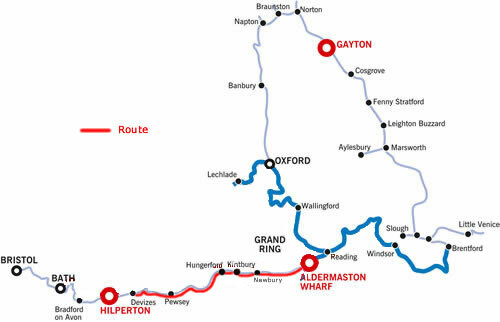 It is 6 hours from Aldermaston marina to here, or 5 hours from Woolhampton and an ideal place for your 2nd nights mooring. It is 8.75 cruising hours from Woolhampton to Kintbury. It is 5.75 hours cruising from Newbury to Hungerford. You can moor up at Hungerford, or continue on to Froxfield and visit the Pelican pub just 2 mins from the canal, and in an area of outstanding natural beauty with a garden by the lake and river. It is 7 hours cruising from Newbury to Froxfield. Little Bedwyn and Great Bedwyn are soon approached, the latter has attractive houses of all periods, a stores and pubs along its main street from bridge 95. From Froxfield you have to negotiate 7 locks to take you past Great bedwyn, as the canal climbs higher. Then another 3 locks as you approach the Crofton Flight of 7 locks with the village of Wilton to the south. The Bruce Tunnel is just 502 yards long, but makes a pleasant change. Towards Wootton Rivers the canal climbs down through a series of locks , the pub in the village to the north of the canal is an attractive 16th century pub in the main street. The village is very pretty & composed almost entirely of timber framed thatched houses. The canal continues through the vale of Pewsey. Pewsey Wharf is a mile from the town centre, and has developed as a Canalside settlement on its own, with a pub, warehouses and cottages. To the North hills descend to the waters edge, to the south the land opens out giving fine views over the Vale of Pewsey. A miniature suspension bridge carries a private footpath from Stowell Park across the canal, as is the only surviving example of its kind. Stowell park House was built in the early 19 century, and can be clearly seen from the canal. 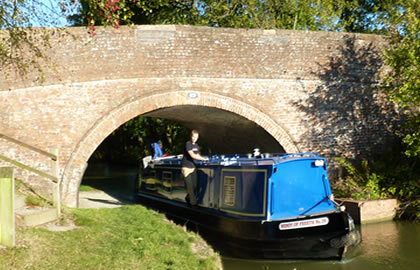 It is 8.5 hours cruising from Froxfield to Pewsey Wharf. The pretty village of Wilcot is soon reached with several thatched houses scattered around the green. There is an annual carnival every year which draws large crowds, lasting for 2 weeks it starts on the 3rd Sat in September and there is plenty going on. On its run to Devizes the canal meanders through rich agricultural land and small attractive villages like Honeystreet- Pub on canal, Stanton St Bernard, All Cannings- pub in village just south of Bridge 128, & Bishop Cannings- access from Bridge 133 with pub in village, or pub by Bridge 134. It takes about 3.5 hours to get to Devizes from Pewsey Wharf. Have a lovely return trip!